If you have any interest in the Olympics, you've certainly seen Beijing's "Bird's Nest" and "Water Cube." But who are the geniuses behind them? And what other structures pad their rÃ©sumÃ©s? Ben Smith's got all the answers below. 1. 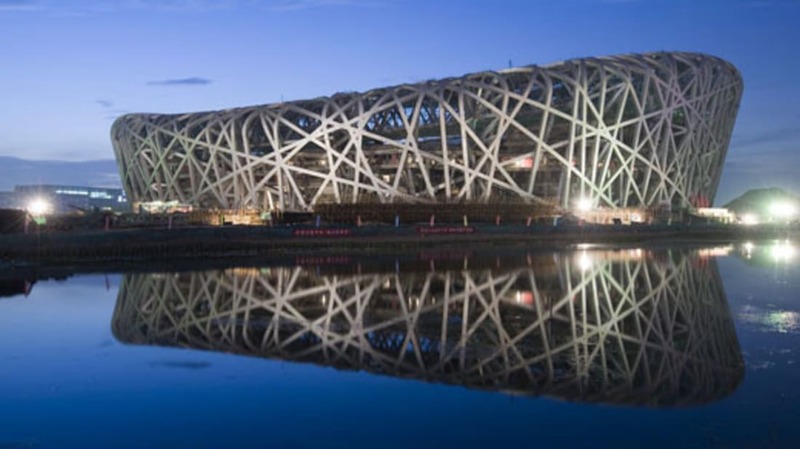 Herzog & de Meuron: The Guys Behind the "Bird's Nest"
It's stunning that in a skyline packed with soaring structures and modern design, it is a stadium that stands out. This isn't a fluke, though. The firm responsible for the "Bird's Nest," Herzog and deMeuron, has a long history of designing functional but distinctive structures. In 2001, they were awarded the Pritzker Prize, one of the biggest honors in architecture, for seamlessly incorporating cutting-edge materials (like silkscreened glass!) into their highly elegant structures. In fact, they've been pushing the boundaries of design for years. As you might imagine, this isn't the Swiss firm's first stadium. They've also designed Germany's Allianz Arena (pictured below) and the St. Jakob-Park Stadium (pictured under) in Switzerland. The Beijing National Stadium, however, is the most sculptural of the three. What Herzog and de Meuron seem most known for, though, is their work with museums. The group gained recognition in this area when they converted Bankside Power Station into what's now the Tate Modern gallery in London. On this side of the pond, the best example of their aesthetic can be seen in their expansion of the Walker Art Center in Minneapolis, MN. The new portion of the museum has doubled gallery space and created a stir with its unusual angles and crinkled-metal exterior. For a better sense of how much space was added, take a look at the tiny pic below. The original building is the brick portion to the right. While the Walker may be my favorite, the IKMZ building in Germany is a close second. Whatever the facade is created from, it creates a stunning effect. 2. PTW Architects: The Geniuses Behind the "Water Cube"
PTW's work isn't often as bold as that of Herzog and deMeuron, but their design for Beijing's Aquatics venue has been making a splash in the design world. Those eye-catching soapy bubbles are based on the Weaire-Phelan structure. And the ETFE (or ethyl tetra fluoro ethylene) pillows that cover the building's steel frame work better than glass-- allowing for more light and heat to enter the building, and decreasing energy costs by 30%. PTW does have experience with other Olympic venues. The firm also designed the Olympic Villages for the Beijing and Sydney games and they oversaw the transformation of the many venues used in the Athens games into Olympic-level facilities. Outside of the Olympic Games, PTW's work ranges from typical skyscrapers in Australia to more exotic designs. Perhaps their most talked about (and frequently web-linked) project is the beautiful Palm Islands development in Dubai. While it isn't exactly easy to come up with the idea for a building that looks like a nest or replicates the pattern of soap bubbles, it's quite a different burden to get the building to stand up straight! That's where structural engineers come in, and Arup provides some of the most creative solutions in the business. The firm first gained prominence when they figured out how to create the spectacular arcs of the Syndey Opera House. The structure had been notoriously difficult to implement, and Arup did it by cutting the shapes from hemispheres of the same radius. Their enormous creativity and massive know-how has pushed them to the forefront of the profession, making them one of the most sought-after structural engineering groups in the world. The Bird's Nest and Water Cube aren't the only Beijing structures the group has worked on, though. The team recently recently oversaw construction on China's new CCTV headquarters. The building is a continuous loop consisting of two towers connected at the top by a horizontal section. The result is yet another spectacular building dotting Beijing's continuously improving skyline. So, what else has Arup worked on? Some of their notable works in Europe includes the Casa da MÃºsica in Portugal, 30 St. Mary Axe in London, and one of my favorite buildings by them, the Centre Georges Pompidou in Paris. Arup's work covers a variety of different and creative architectural styles that woudln't otherwise be possible without their knowledge.